``Adventures of Lolo 3 is a puzzle game released in 1991 by HAL Corporation for the Nintendo Entertainment System. It is based on the Japanese Eggerland video game series. 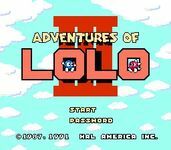 It was the third and final installment of the Adventures of Lolo series released in the U.S. This game included some new additions to gameplay. In Japan, this game was released as The Adventures of Lolo 2 because Adventures of Lolo was not released in Japan. Additionally, the Japanese version of the game had a different difficulty curve, different stages, and Moby (the whale-like creature) appeared in Level 9 instead of Level 11. Source: Wikipedia, "Adventures of Lolo 3", available under the CC-BY-SA License.